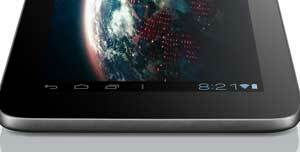 Lenovo IdeaTab A2107 7 inch 3G Tablet Cortex-A9 1GB RAM 16GB Storage Android 4.0. This fully featured portable device is ideal for carrying all day long. Having great entertainment features, it lets you keep all your favourite books, songs and movies just at the palm of your hand. This tough and affordable device gives you a PC like performance. It offers you a soft touch with matt cover. It is designed for a light grip so it does not slip from our hand. 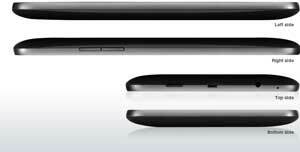 With its nature inspired design it looks smaller and thinner. It is designed to give you all the comforts and benefits of the portable 7" tablet size. With its small and compact size you can easily put it in your jackets pocket. By being small and light enough to hold in one hand, it offers you effortless reading, watching and listening. Having gentle grip, it gives you a peace of mind as you wont worry about its slipping and falling down. Inspired by the tough designs of ThinkPad laptops, IdeaPad has a durable interior roll cage design. With this design its sensitive components are better protected and offer enhanced resistance. Its 7 screen is perfect for reading a novel, checking information online and interacting with friends on social media. Its portable design lets you carry it easily without carrying a bulk. With 350 nits its HD screen is extremely bright offering better viewing experience. The bright screen helps you in reading under bright sunlight. Take most from your films and pictures with its extraordinary bright HD display. It features responsive four-point capacitive touch input for easy navigation and exciting gaming. It also lets you enjoy rich stereo sound even without headphones through the built-in dual stereo speakers. This innovative device is equipped with highly intuitive Google Android 4.0 "Ice Cream Sandwich" operating system. 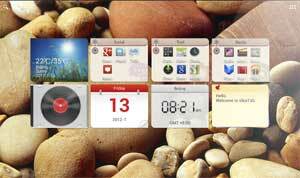 This specific version is especially designed for tabs and its interface is very simple and clear to use. With Android 4.0 you get better performance in multitasking, easier folder navigation, resizable widgets, voice input and more powerful web browsing. The essential preloaded apps make reading, social networking, daily life, work and entertainment simpler and available at your fingertips. It also features the familiar Google Mobile services including YouTube, Gmail, Google Maps and more. Plus it lets you enjoy thousand so f apps from Google Play Store. This incredible device also features Lenovo's simpler, clearer Mondrian User Interface. With this user interface you can easily find and navigate your favourite apps. It offers a number of customizable homepages which you can fill with useful widgets, both from Lenovo and from third-parties. Take most out of your web chats with its built-in 1.3 MP camera. It streams high definition images and gives you clearer video that's perfect for conferencing. 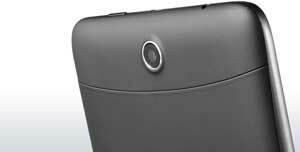 It also features a 5.0 MP rear-facing camera which lets you capture special moments and share them with your friends. With its multiple options of wireless connectivity it lets you stay connected to your world easily. The built-in 802.11b/g/n Wi-Fi adapter lets you to enjoy reliable connections to the Internet at public networks and homes. With Bluetooth 4.0 you can easily share your content with other devices in less time. It offers you the latest version of Bluetooth and also gives you the NFC technology. It features a long lasting battery which enables you to have more productivity and entertainment. With Wi-Fi connected you will be able to enjoy up to 10 hours of online productivity before it needs to be re charged. 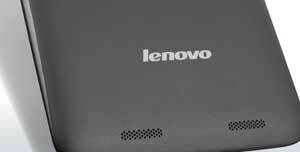 So take your Lenovo IdeaPad on the go without worrying about its battery. Its advanced GPS system gives you a direct satellite link, and can find your position in few seconds. No need to worry about network ability anymore as you'll be able to quickly and easily get a fix on your position and use apps such as Google Maps to find directions. Finding restaurants, banks and markets in a new location is not a problem anymore. Lenovo IdeaPad also features a built in radio which allows you to listens your favourite sound tracks even on the go. Plus you can also keep yourself updates by listening to the latest news. You dont need to connect to wi fi for staying updated as its built in radio is there to take care of it.